KIEV, Ukraine -- Ukraine lost eight soldiers Wednesday in a dramatic spike in fighting with pro-Russian gunmen that further imperilled a truce Washington's top European envoy is desperately trying to salvage in Kiev. Ukrainian Security forces patrol in the village of Bobrovyshche near the small town of Mukacheve on July 14, 2015. Separatist rebels also reported the death of two fighters and a civilian in shelling across the eastern industrial heartland of the former Soviet nation that took a decisive tilt toward the West more than a year ago. The resulting crisis has created waves of security worries across eastern Europe and sparked the most serious diplomatic standoff between Moscow and the West since the Cold War. The Kremlin denies backing the militias in revenge for the February 2014 ouster of a Moscow-backed president that was soon followed by Russia's seizure of Crimea. Kiev's Security Council said early Wednesday that the previous 24 hours had witnessed "some of the most intense bombardments of Ukrainian territory since the signing of the Minsk (truce) agreement" in February. It said 16 servicemen had also been wounded without specifying where the deadly exchanges of heavy weapons fire had broken out. "The latest events are proof of yet another attempt by Russia and its puppet to wreck the Minsk agreement and restart active military hostilities," the Ukrainian Security Council said. The insurgents said on their main website that the number of Ukrainian attacks had more than doubled to 85 from the 35 recorded Tuesday. The United Nations believes that more than 6,600 people have died and nearly 1.5 million been left homeless by unceasing violence that Ukrainian President Petro Poroshenko had vowed to resolve within days of being elected in May 2014. But the Western-backed leader has instead seen the insurgents cement control over their holdings in the Russian-border regions of Luhansk and Donetsk. Kiev and Washington accuse Russia of plotting periodic ground offensives that it backs up with tanks and rocket launchers as well as highly-trained military personnel. 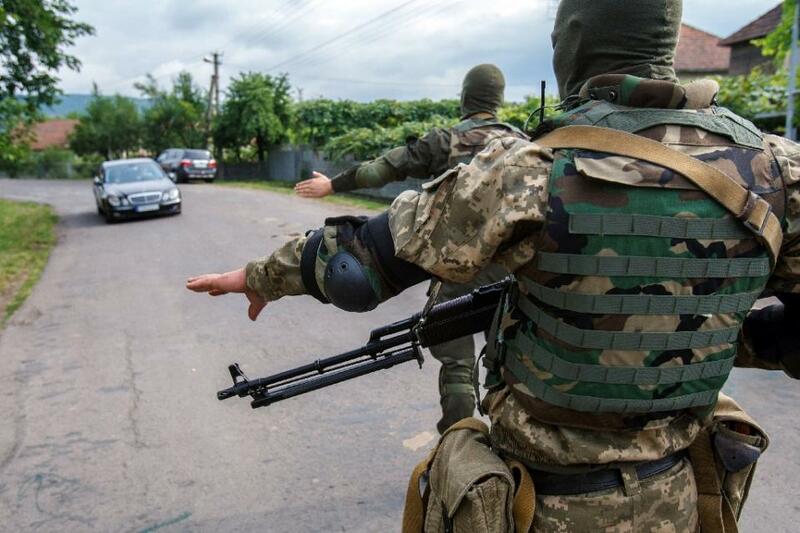 Western reporters have also witnessed unmarked armoured vehicles crossing from Russia into southeastern Ukraine. Moscow brusquely brushes off such charges as fabrications designed to discredit Russian President Vladimir Putin. Putin calls Russians fighting in Ukraine patriotic volunteers and off-duty soldiers who are following "the call of their heart". Yet the veteran Russian leader and Poroshenko reluctantly put their names on a February truce deal that was personally promoted by Germany's Chancellor Angela Merkel and French President Francois Hollande. Both European leaders are close allies of Kiev who nonetheless value keeping lines of communication with Moscow open. Merkel and Hollande argue the truce can be saved by Ukraine's adoption of a constitutional amendment that spells out the eastern guerrilla's right to control their regions for at least three years. The EU duo pressed that message on Poroshenko during a conference call on Friday and repeated it to Ukrainian parliament speaker Volodymyr Groysman on Tuesday evening. US Assistant Secretary of State Victoria Nuland met Groysman as she kicked off a two-day visit that coincides with parliament's vote Thursday on the changes to Ukraine's basic law. "She kept stressing (to Groysman) the importance of (Thursday's) vote," a parliamentary source told AFP after the meeting. Nuland told reporters that she also asked parliamentary leaders to push through a stalled raft of economic restructuring measures backed heavily by the International Monetary Fund. "Tomorrow is yet another historic day," she said. Nuland is also expected to speak Thursday to Poroshenko and Prime Minister Arseniy Yatsenyuk -- a relentless Moscow critic who is also tasked with steering Ukraine toward financial self-sufficiency and eventual industrial growth. But many in Kiev share Yatsenyuk's reluctance to give the rebels formal powers in the midst of battles that flare often and show few signs of approaching a definitive end. "The world wants to turn this into an 'internal conflict' because it is tired of dealing with this extremely unpleasant issue," deputy parliament speaker Oksana Syroyid wrote on Facebook.